“Unloading a Barge, Sunset” (PDR 85) is an incredible painting, even in a photograph. Painted about 1864, it is one of the few survivors of the Franco-Prussian War (1870-71) during which thousands of Pissarro’s artworks were destroyed. We can only wonder how many other beautiful canvases were lost. At first glance, we are reminded of the painting that gave Impressionism its name, Monet’s “Impression, Sunrise” (1872). Pissarro made this painting eight years before Monet’s painting and ten years before the First Impressionist Exhibition. It is possible that Monet saw this painting by Pissarro in Louveciennes when they painted together before the War. Even at this early stage in his career (Pissarro had come to Paris only nine years earlier), the artist was making his own rules. The standards for art during those days was set by the French Academy in their annual Salon exhibitions. Their mandates were clear: important topics, historical or mythical; smooth finish, no visible brushstrokes; giant canvases suitable for public buildings, and more. This painting defies every dictum. The focal point is clear—a dark, shadowy barge in the foreground, its mast pointing our eyes to the top of the canvas. It depicts a workaday scene, a man pushing a wheelbarrow down the gangplank unloading goods. On the other side, a man standing in a small skiff works with someone on deck. At the right edge, a small white sailboat describes the width of the river and emphasizes the painting’s strong asymmetrical composition. The painting is tiny by any standards, approximately 7 1/2 x 9 1/2 inches. Unlike most of Pissarro’s later paintings, the title of this one does not indicate the location. But the type of boat and width of the river suggest that the location could be somewhere on the Seine River near Paris. Pissarro had made other paintings of barges at La Roche Guyon, a village near Giverny, and this might be the scene, but with the background subsumed in blue-grey shadows, it is impossible to know for sure. The boat and all the figures are mere silhouettes against the sunset, brilliantly depicted with bold brushstrokes and heavy impasto, paint layered on as thick as butter on toast. The brilliance of the sun is masterful, created with a cool pale yellow which we see as white hot. Its heat tinges the nearby clouds with rose, coral and pale pink fading gradually into the darker blue of the overcast sky. In the dark water, shimmers of white and gold and red surround the dark reflection of the barge. Many artists would have moved beyond the barge to give the sunset and the glimmering water the most emphasis. 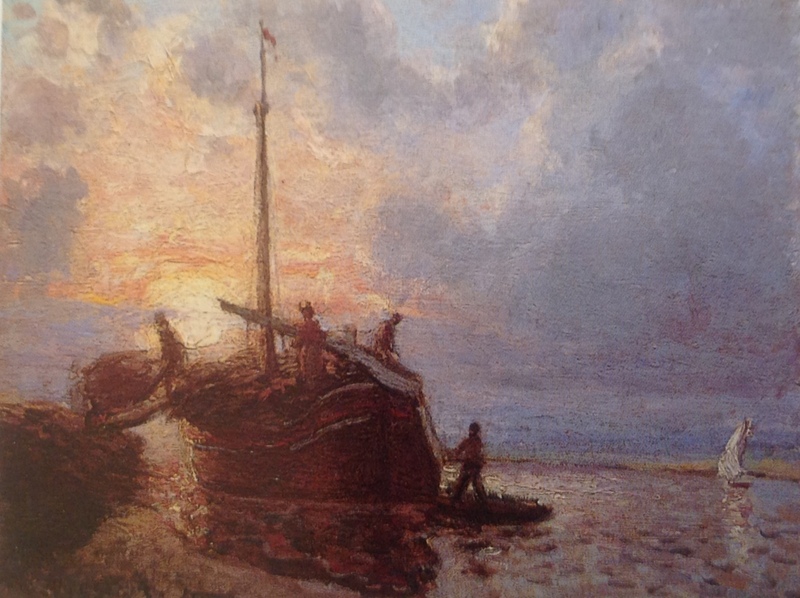 But Pissarro forces us to look at the boat first and makes our eyes work to get beyond it to the colors in the sky. A radical composition and a true treasure. Many readers from this blog are from Germany—there are at least two today! Over the past few months, 348 views have been from Germany. If you are one of those, or if you are from Belgium, France, or any nearby country, you might be interested in this Pissarro exhibition! 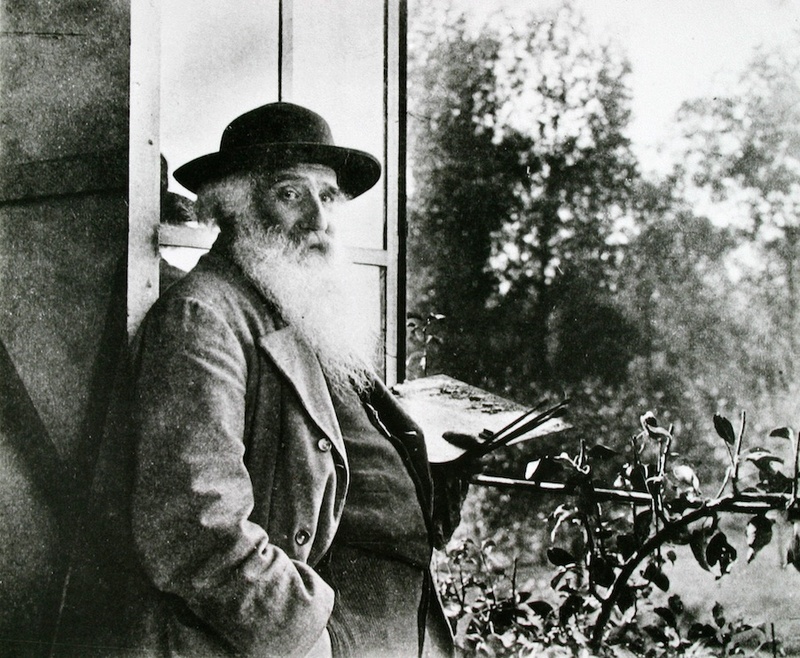 The exhibition contains nearly 60 paintings by Pissarro and an even larger number of his works on paper—drawings, etchings, prints, wood block prints and all types of media. They are paired with a large number of paintings by other painters of that time, most notably paintings by Fritz Melbye, who went with Pissarro to Venezuela, and Ludovic Piette, his very close friend and owner of Montfoucault, a large farm in Brittany where Pissarro and his family visited frequently. There are also paintings and drawings by such artists as Corot, Daubigny, Courbet, Manet, Gauguin, Monet, Sisley, Signac, Cézanne, Seurat, and other painters contemporary with Pissarro. WE HAVE ONLY BEGUN TO UNDERSTAND HIS GENIUS. This painting is currently on view at the Phillips Collection, Washington, DC. I watched as people looked at it. They inevitably turned back for another look–sometimes two or three times. “Vue de Bazincourt, Brouillard” (1894, PDR 1024) is a tiny oil painting, about 13 by 16 inches, but it is a little treasure. It was among the paintings available at this fall’s Impressionist auctions, and one very discerning collector took it home. 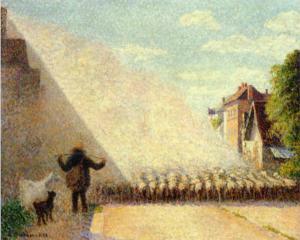 Pissarro made this painting at his home in Érany-sur-Epte. He may have been working beside the back window of his studio, a remodeled barn in the field behind his home. He was looking across the tiny Epte River, indicated by the slightly darker line with trees on the sides, towards the church steeple in the neighboring village of Bazincourt. It must have been early spring because the pastures have a tinge of green, and the horizontal stripe in the foreground appears to be plowed ground. Everything looks misty because of the heavy fog. The mauve-like color in the foreground fades into pale green, which merges into pale coral before disappearing into the gray blue sky. 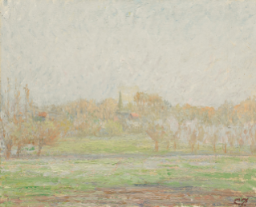 When you see this painting in person, the fog appears much heavier, and the colors and shapes are less distinct. In fact, it you stand back from it, it looks like a Rothko, simply strips of color fading one into the other. Pissarro was painting what he saw, but he did not see a village and fields and trees. He simply saw strips of color—an abstract motif. This stunning painting, The Village Screened by Trees, (1869) seems so simple, yet it is an enigma. There is a village bathed in the crisp clear sunlight of autumn. We long to hurry through the trees to see it more clearly. But Pissarro holds us back and forces us to take a more complicated view. A thick stand of tall trees creates a screen that blocks our sight line and demands our attention. This is the first of Pissarro’s paintings to use this unique device in composition. 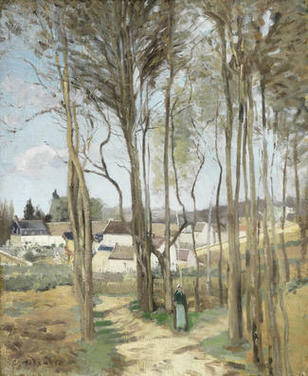 Some of Pissarro’s earlier paintings were similar to those of Corot in that they used rows or groups of trees to frame the view. This painting, however, does the opposite—the trees obstruct the view, forcing our eyes to wander in an out of the spindly tree trunks to piece together our view of the village. Years later, Pissarro took this device to the extreme in his painting La Côte des Bœufs, Pontoise (1877) with a screen of trees that covers the entire canvas. We could ask why Pissarro did this, but there is no answer. What we do know is that most Impressionist paintings have a clear focal point, and the picture’s elements are arranged so that the motif is easily understood. This composition of this picture does the opposite. In 1869, five years before the First Impressionist Exhibition, Pissarro’s concept of forcing the viewer to look through a screen was totally radical. This painting presents other puzzles as well. Most landscapes are horizontal in shape, but this one is vertical, which easily accommodates the tall trees. While the actual date of the painting is unknown, it has been placed at 1869, the year Pissarro moved to Louveciennes. 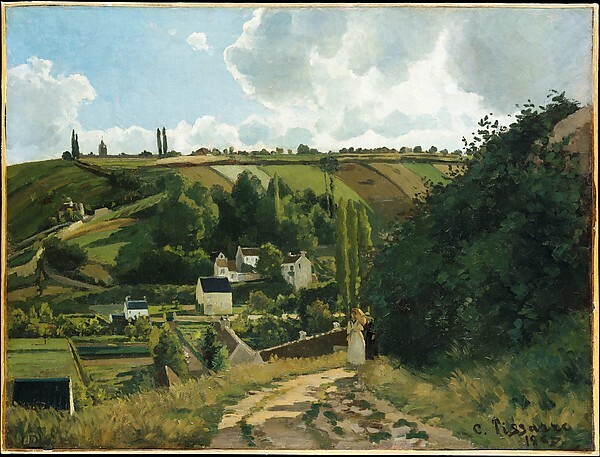 Scholars say that the actual village is unknown since its particular topography does not appear to match Pissarro’s other views of either Louveciennes or Pontoise. However, Pissarro points the way through the screen. Directly in front of us is a walkway leading to the village and a smaller path branching off to the right. Together, they form a strong V that anchors the composition. Just to be sure we don’t miss it, Pissarro places a small figure of a woman in the angle. He repeats this angle in the limbs of the tree just above her head and again in the background with the two sections of wall leading into the picture from each side. While some might think this painting somewhat bland compared with other works of its time, it is, in fact, highly sophisticated and experimental. Perhaps if so many of Pissarro’s paintings of this period had not been lost in the Franco-Prussian War (1870-18871), he would be correctly recognized as the artist who was far ahead of his time.